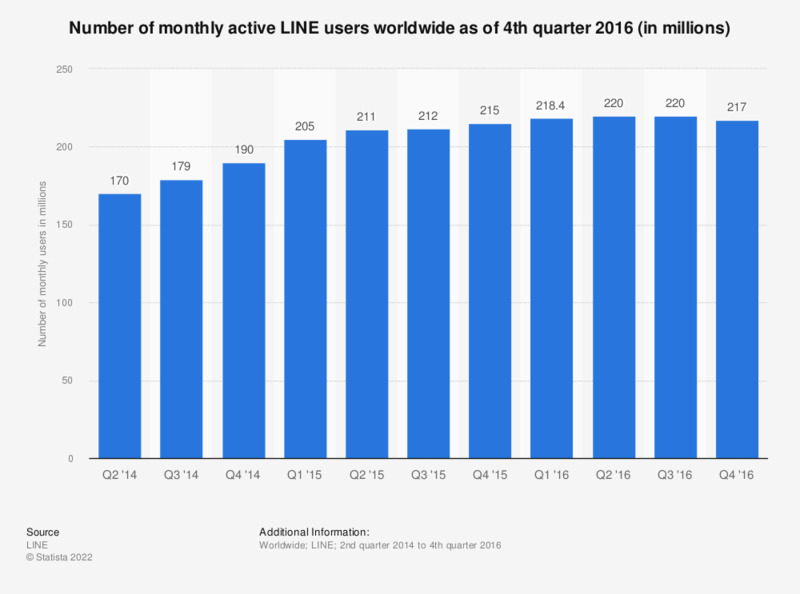 This statistic shows a timeline with the amount of monthly active LINE users worldwide as of the fourth quarter of 2016. As of that period, the mobile messaging app announced more than 217 million monthly active users. In October 2014, LINE had also reported 560 million registered users worldwide. The Japanese messenger app LINE was developed by engineers at NHN Japan, an arm of the South Korean Naver Corporation, in response to damaged telecommunications infrastructure nationwide in the aftermath of the devastating Tōhoku earthquake in March 2011. It was initially meant as an alternative communication channel for internal company use, but was released to the general public later that year. Although it was intended as a mobile app for devices such as smartphones and tablet computers, later versions were made available on personal computers. Its main functions are exchanges of text, photo, video and audio messages, as well as performing of free Voice over IP (VoIP) conversations and video conferences, playing games and interacting with both personal connections and public accounts. As of 2012, LINE developed into a social network, with features similar to Facebook, such as a timeline where users can post status updates and other content. The sticker store, where users can create and sell their own LINE chat stickers, is one of LINE’s most popular features among Japanese users. LINE is ranked among the ten most successful mobile messenger apps in the world. It is at the same time the second most successful on the Asian market, after the Chinese-based WeChat, but before the Korean KakaoTalk. Until October 2014, LINE reported registered users only. The source has stopped reporting quarterly figures as of Q1 2017.